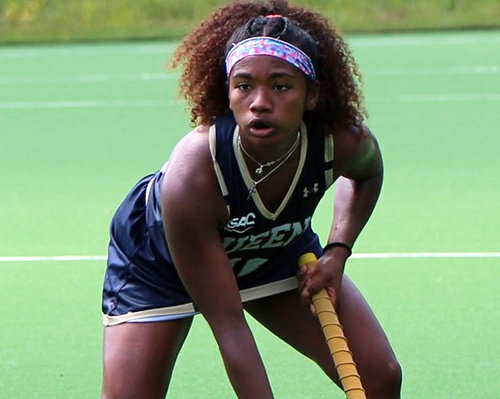 Maha Clarke and her Queens University of Charlotte Field Hockey teammates suffered its first South Atlantic Conference Carolinas loss falling 4-3 at Coker College. The loss brings the Royals' overall record to 7-4 while dropping their league record to 5-1. The Cobras improve to 2-4 on the year and in conference play. Mazvita Mtisi led the Royals with three shots, two coming on goal. She also recorded a goal along with Millie Eaton-Jones and Clarke. Jet van den Berg tallied two saves in the loss. After Eaton-Jones got the Royals going with a goal in just the second minute of action, Coker responded in the seventh to tie the game at 1-1. The Cobras then added two more goals to their total to move in front 3-1 before Mtisi found the back of the cage to close the gap to one, 3-2, heading into the halftime break. Queens continued to trail by one in the second half until Coker was able to score again in the 50th to increase its lead back to two, 4-2. A goal from Clarke in the 54th followed to close the gap to one, but that was as close as the Royals would get to tying things up again despite earning three penalty corners in the remaining minutes of regulation. Queens was edged in shots 11-10, though they would put eight shots on goal compared to Coker's six shots on goal. The Royals also earned 10 penalty corners to Coker's three. Kelly Mason and Amelia Gajewski scored two goals each to lead Coker. Kelsey Gibbons recorded three saves in the cage while Simcha de Vilder and Payton Barronella-O'Toole tallied one defensive save each.